Jason Roy of England hits a boundary during the fourth ODI against Australia at Durham on Thursday. 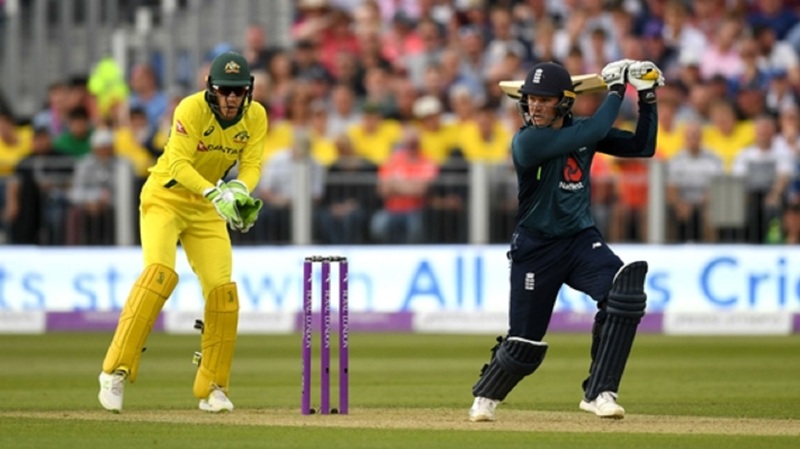 England remain on course to complete a series whitewash over Australia after recording a comprehensive six-wicket win in the fourth ODI at Durham on Thursday. Aaron Finch (100) and Shaun Marsh (101) each recorded centuries as Australia - who elected to bat first after winning the toss - posted a respectable 310-8. 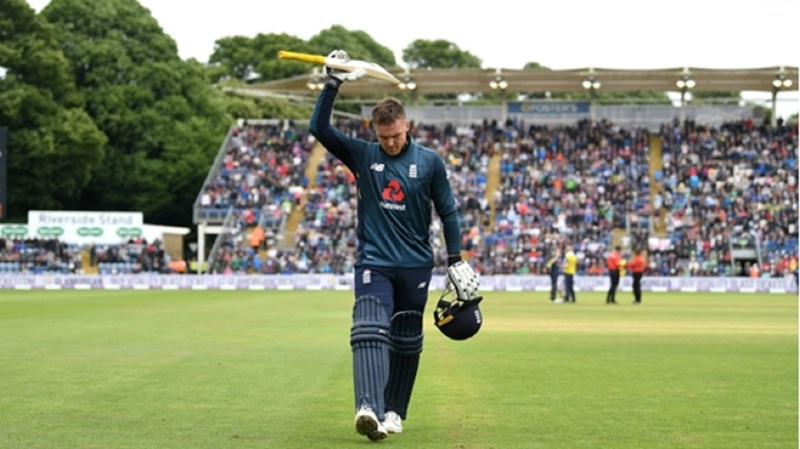 Yet Jason Roy's knock of 101 saw the hosts - who made a record-breaking 481-6 at Trent Bridge on Tuesday - comfortably chase down their target, as they raced over the line with 32 balls to spare. England started at a fast pace before Jos Buttler (54 not out) rushed them over the line, meaning they can complete a sweep with victory at Old Trafford on Sunday. Having made the mistake of sending an in-form England in last time out, Australia unsurprisingly decided to have a bat after captain Tim Paine called correctly. Finch and Travis Head (63) built a strong early partnership to stave off the first wicket, with the former then continuing alongside Marsh in a 124-run stand that set the platform for a big finish. However, David Willey's (4-43) death bowling - the left-arm seamer claimed three wickets in the space of six balls - limited Australia's onslaught, with Marsh falling when Roy's clever offload presented Craig Overton with a simple catch. If the tourists felt their total might have been enough, Roy and Jonny Bairstow (79) soon put it in perspective with a dominant opening stand. There was a lull after the pair departed at the midway point of the innings, however, while Joe Root (27) and Eoin Morgan (15) failed to stick around for too long. 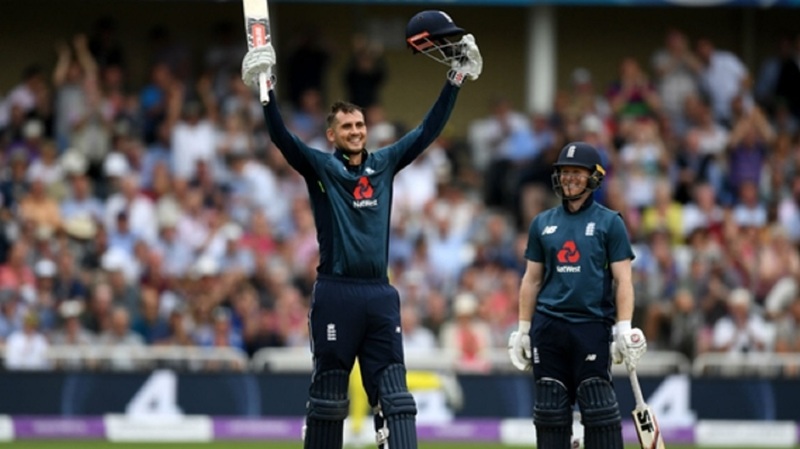 But Buttler was on hand to crush the tourists' slim hopes of ending their losing run, with Hales happy to play second fiddle as he finished unbeaten on 34.